Can I use regular tap water through it? My water is kind of hard. I know everyone RECOMMENDS RO or distilled, but would I be able to just soak the nozzles in vinegar periodically? Or even run vinegar straight through the system? If no to the above question, does anyone know the real answer if distilled is bad as drinking water for reptiles? I have seen both arguments but no actual evidence for either. The plan is the misting will be the gecko's sole source of drinking water. Will the mist from MistKing be to fine? or will there be enough droplets formed on surfaces for them to drink from? Right now I spray the enclosures at least every other night (that will go to every night once its warmer) and watch them drink. Many people start off using RO but abandon it. Some things are satisfying to clean and some things are just easier to replace. For me nozzles and sprayer heads fit into the replace category. TDS levels contacted by most animals in the wild vary; in my way of seeing things any absolute uniformity with something as important as water can be easily avoided. Be it having absolutely no dissolved salts and minerals or being too hard. I use distilled for my frogs misting but their water pool leans slightly hard. 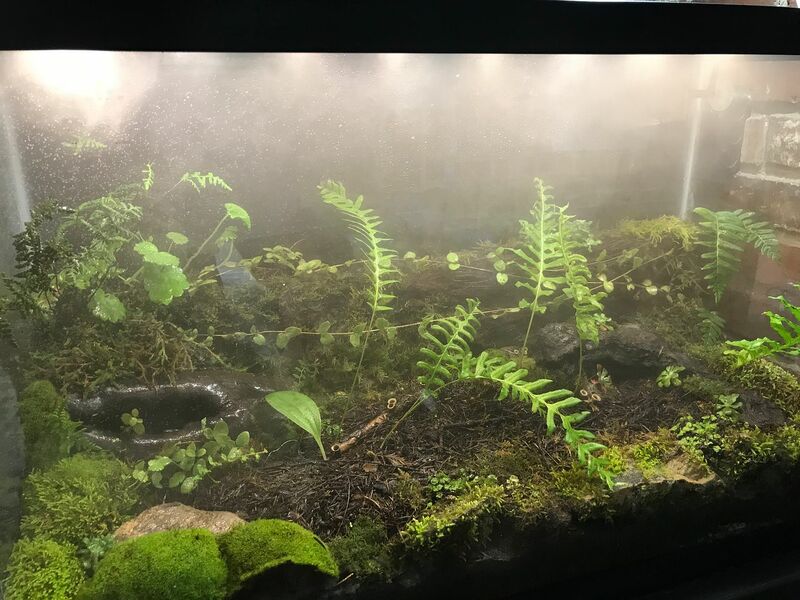 When switching to an automated system its a good idea to maintain a conscious intimacy with that window of check that you have fostered when misting by hand. Keep it up a while. Adjustments will be forthcoming. Thanks Kelly for your always present good advice. I will definitely stay on top of them. I will be getting some hatchling henkeli in the near future, and don't want to have to worry about them if I go away for a few days. (Also hoping to hatch my own sikorae this year). One of the perks of keeping reptiles is the ability to leave them alone when needed. But tiny little geckos that likely wont drink from a bowl makes it a little more tricky. And like you said, adjustments will be needed so I am going to set up full time so I know its running properly instead of setting it up only when absolutely needed a couple of times per year. For the record, I have asked around elsewhere too and everyone agrees that misting heads just cant effectively be cleaned. I favor the units sold by ProProducts. I've played with automated watering for a while now. - When I began, I built my own (first efforts looked like something out in the yard, and evolved into kinda like what you see at the produce section of your grocery store). - Eventually I quit that, and have accumulated several MistKings; never have yet retired a pump from there. - I have no experience with other commercially-available stuff. I have no plans to get any experience with other brands. I've found what I like - rugged, dependable, totally configurable, with the best customer service you could hope for. I'm a true believer in "do you need fast, good, or cheap? - you can't get all 3 at once so pick the 2 you need most". MistKings are fast (no tinkering, just plug & play) and they are good. They aren't cheap. But hey, cheap is usually junk. You could blend tap and RO if you're that worried about it. I also figure straight RO might be a little too low-mineral for animal life. I just run straight tap water and watch my nozzles. I don't screw around with cleaning misters either. Not any more - it either just doesn't work, or it seems to but doesn't last long at all. My experience anyway; maybe I was doing it wrong. You're gonna need to play around with spray duration and frequency until you get them dialed in. You'll probably see some seasonal differences (just as you note with your hand-misting) and will need to tweak your settings. Buy one of MistKing's seconds timers. Very easy to figure out and use. You'll love it. I'm also gonna put in a plug for drains. (See the pun? ha ha ha). Seriously, water in, water out. Out how? Solely evaporation? Not bloody likely. Manual removal? Blech!!!!!! Stick in a drain, let gravity work for you. My background is venomous snakes, a key to staying healthy is to keep your hands outta the cages, so I am biased HARD to no manual removal. Still though, who isn't a little lazy, who doesn't go out of town once in a while? Drains. One flood, or zero floods, will make you a believer. Why not just skip the flood? The frog guys (I am not one; I do squamates) are all over this topic. 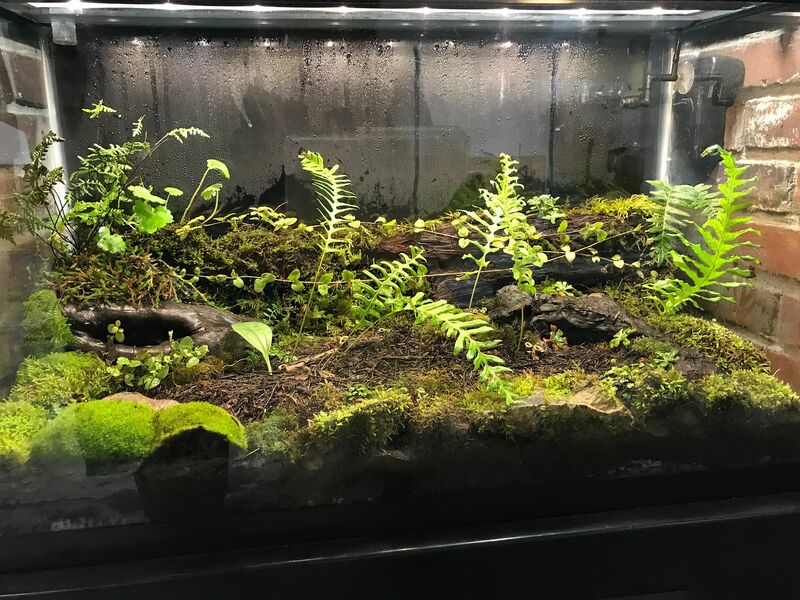 I think you're basically looking at a dart-frog viv, upsized and with more ventilation. Check out Dendroboard and maybe some other resources. Holler if I can do anything else. Something I found myself gravitating toward in misty situ was a drizzle or rain area dynamic that was time consuming to set up, test out but made up for it in other positives. In my most significant use the system (valved containers) manually filled, but no reason it couldn't be automized. The dynamic of falling water is a rewarding challenge to manipulate and contain. Animals seem to really key to it, dig it. "Water feature" is something of a cuss word for those who have dabbled with them. Water is an absolute bugger to subjugate, it seems to have a will. I have never hard-plumbed into my house supply. The flood risk just scares me too much. In my stand-alone systems I have done both open and closed systems. - Closed systems are riskier in terms of pathogen & contaminant buildup. Requires filtration, a bit of a hassle, and stronger pumps. More electricity and just more gear. It's also much more of a technical challenge dialing in flow rates between sump(s) & tank(s). Steady flow or on/off flow are both possible. Size of the potential mess is only limited by the total system water volume! Ha ha ha. - Open systems consume more water, thus are more useful in on/off situations. No filtration needed, just "throw away" (houseplants...) the used water and refill the source tank (which you could easily plumb with a toilet valve; hauling water gets old). I'm currently doing some new builds with drip lines and mister heads; I only need the water to come on 2-3x/ week to keep my moss & cork background wall hydrated. These new builds have drains because I don't want to try and balance input & evaporation, it's easier to just let it run. Plus there are some small pools the moss drips into and I want them rinsed and topped off every cycle. Jimi's descriptions and comparisons are excellent. I have had some recent experience using an Exo Terra Monsoon mister in coordination with a Zoo Med Repti Fogger. When I run them together for about twenty seconds they whip up a pretty good rain storm. Definitely not the same grade unit as the Mist Kings mentioned above but they serve my needs ok.
At first I was using filtered tap water out of the fridge in these units but it didn’t take long for some of the Ferns to start twisting up and producing deformed leaves. I figured the ph in the tap water was wrong for the plants so I switched to RO and distilled. All new plant growth has been regular since and I don’t get hard water stains on the glass to boot. I would have to think its better for the salamanders also. I have noticed increased nocturnal activity out of my salamanders if I run the water system before or shortly after dark. Even more so if I open a door or window and cool it down during and after misting. Wonderful Sallie land you have going there Jason Hull. I really like the nice user friendly margin on that water pool too! Thanks for the good words Kelly Mc. I think the reflection on the glass creates the illusion of a pool but I have stayed away from water features for reasons mentioned above. All the inhabitants are terrestrial species anyway so it would be purely for aesthetics. This is another enclosure that I’m getting close to finishing for another species. I’ll use both the mister and fogger with this one also. Nice vivs Jason. I like the use of seedling native conifers - super atypical but I can now see their benefits (slow growth, little pruning, some can take low light etc etc). I'm curious about your growth medium. I think I saw a peek of eggcrate so I guess you're going with false bottom. What else you got down there? I wanted to simulate the micro habitats of the animals as close as I could. Once I started looking closer I found plants, rocks, wood and fungus (all taken from private property) that were all pretty attractive IMO as well. Dialing in the right amount of light is what I’m dealing with now since some of the plants were growing in different exposures. If I can get it right I’m hoping most of the plants will make it even if they don’t put on max growth. In both set ups I have a 2’’ drainage layer made up of clay hydro corals with a layer of filter fabric over it to prevent soil from contaminating the drain layer. I put a black 1/2’’ pipe going down into the drain layer with a v cut in the bottom so I can syphon it out when it gets full. I put a piece of fabric in the pipe when I’m not using it so the salamanders won’t go down it. In the first set up I have a couple inches of triple mix soil above the fabric. On top of that is a piece of root mat taken off the forest floor and placed on top of the soil. The root mat is cool because it has ferns, moss, and other plants already in it. 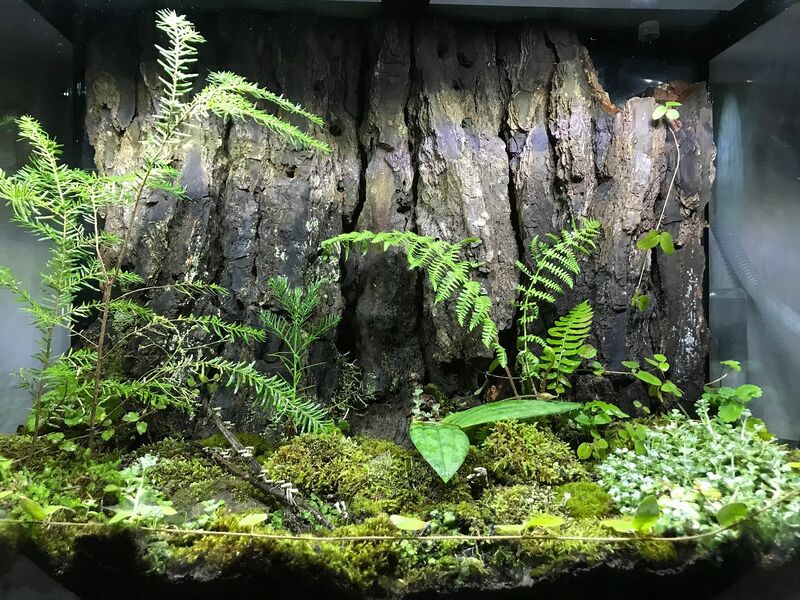 The second is the same but with about 3’’ of soil and the plants, wood, and rock directly on top of that. Dialing in the right amount of light is what I’m dealing with now since some of the plants were growing in different exposures. If I can get it right I’m hoping most of the plants will make it even if they don’t put on max growth. I've used that stuff (LECA) quite a lot. Also GrowStones (much ligher, and IMO more attractive). I just got a shipment of Matala filter material for a drainage layer in some new builds - just gonna lay my fabric right on top, and go with ABG or similar as a grow media. Beautiful, and ah, I think I superimposed my penchant for puddles indeed. To collect ones own materials for use is fun. If industry can treat media so can the private practitioner, if they choose. For some, going to extremes isnt even that necessary. Which is a totally risky un pc thing to say, but sometimes things just go nicely. light meters can be had for <20 bucks on Amazon. I would disagree about running tap water. Distilled/RO is cheap even without having a unit. You could also harvest rainwater if you live somewhere with ok air quality. The problem with running hard water is not just eventual clogging of the units....I found that it causes deposits on the glass that are a pain to get rid of. Better just to run soft water rather than make more work. Sorry Joseph, my bad: I should have clarified I was talking about PAR meters. Not just "lumens, whatever the spectra". Indeed a problem for all-glass or small vivs. Most of mine only have glass fronts and are pretty big. I install my emitters back about 20-25% of the viv depth, and keep them all pointed in the right direction (~ toward the center of the rear wall). No water on glass = no mineral deposits. The inhabitants occasionally nudge the emitters in the wrong direction, but I catch those pretty quick & re-direct.